Time to return to the subject of portability in cameras. This post is non-technical (ish) and is an update on my current fave for “the camera in your hand”. Despite the fact that the Fujis have given me great pleasure, and that the F900EXR and F660EXR both appear on the Photography Blog best cameras list, I have moved on. This is actually because I became a bit obsessed by the edge sharpness of the F600EXR. A few too many photos had to be cropped because of the softness at the edge, so I wondered what the latest breed of Canons were like, and whether they had the same problems. Now Canons are not cheap, and I was not up for the latest long-zoom compact, the well reviewed S260x, partly because at the time of desiring one, they cost upwards of £300 (or $500). Now they are cheaper, but in any event, I didn’t want GPS function or the 20x zoom that it came with. So I opted for one of it’s predecessors, the SX220, which has the same image quality (and processor), but with no GPS, and a 14x zoom. I got it on eBay for £100 or so, and it has been great fun, and is currently my top choice and recommendation. Now one of the reasons I loved the Fuji F600, was that it was the only long-zoom compact that allowed shooting in RAW (the native format that allows more control and dynamic range when processing). None of the Canon compact zooms have native RAW support either. So this eliminated them for me, until I came across the excellent CHDK (or Canon Hack Development Kit ). This is an amazing example of Internet wonder, which basically swaps out the firmware (or operating system) of many Canon Cameras, for a vastly enhanced version. Once installed, CHDK provides RAW files, bracketing, full manual control over exposure, zebra mode (showing highlight clipping), live histogram, grids, and a great deal more. As a result, I now have a camera with excellent image quality, that shoots in 12-bit RAW (straight to Adobe DNG format), and that is so small it can be taken with me at all times. And it cost peanuts. I really am quite amazed by this system. The level of control over the camera is huge, but despite this, the ease of use is outstanding. I use the thing in full manual most of the time, but because it has an on-screen RGB histogram and a display of highlight clipping, I get nearly perfect photos every time. It’s not a total breeze installing CHDK for this camera, but for anyone who is interested, I can provide the files for the SX220 (including my on-screen display settings), and here is a link to the page with the instructions. Once you know how, it takes about 10 minutes to install it, and there you have one of the best if not the best compact zoom cameras, for about 100 quid. So where am I heading next? Well truth to tell, I am starting to get interested in 4/3rds cameras again. The Panasonic 14-42 kit lens (28-84mm equivalent on full frame) is so compact, and the recently superceded Panasonic Lumix G3 (a 5* review in DP blog, and their camera of the year, 2011) is such a bargain right now at about £370 (half the price of a year ago, and pretty much half the price of it’s successor, the G5), that I am sorely tempted. Just need to get past the appalling expense of the Chickadee’s and my hedonistic birthday celebrations, and I might well blag me one. 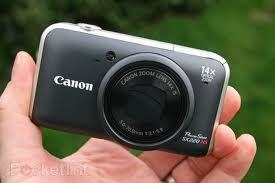 But even if I do, the Canon is going to stay in my pocket for the long haul. For a RAW compact zoom, there’s nothing to touch it.